In association with Travelodge we are proud to bring you Discount Airport Parking when you stay at the Travelodge on your departure or return. There are loads of reasons our customers choose to stay at Travelodge. Our great value clean and comfortable rooms with en-suite provide everything needed for a good night's sleep and are close to where people want to stay. Travelodge can offer fantastic value accommodation all year round because we do things differently to other hotel companies. We keep our costs low and pass on the savings to our customers with low room prices. At Travelodge, we provide everything you need for a comfortable night's sleep, whether you're on the road for business, or enjoying a city break with your family. 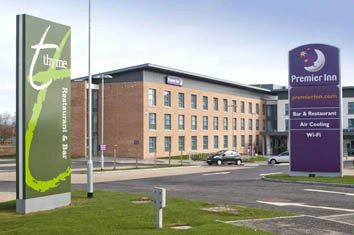 Just off the M8 and under 10 miles from the heart of the city and its attractions, the hotel provides a great base for exploring the region, catching an early flight and for the commercial Newbridge district. The hotel has everything you'd expect, incredibly comfy beds in every room and an integrated Thyme restaurant serving a mix of traditional and contemporary dishes. To receive discount on your parking please quote your hotel confirmation number. Click the link above to compare prices on hotels near Edinburgh Airport. Search once to find the cheapest rates from 10 different websites.